The US-China Mar-A-Lago Summit: The Culmination of a Trump Negotiating Strategy? The apparent contradictions in Trump’s China policy can be understood as part of a high-stakes bargaining game. Many observers expect that the upcoming U.S.-China summit between President Donald Trump and Chinese President Xi Jinping, planned for early April at the Mar-a-Lago resort, will be long on soothing, reassuring words and short on substance. Trump granted the summit to Xi largely as a gesture of good will, the argument goes, and to convey to the Chinese leader the same level of respect that he gave to Japanese Prime Minister Shinzo Abe when Abe was invited to the plush resort last month. Whether largely ceremonial or not, at the very least, the summit should end the glaring contradictions in Trump’s China policy witnessed thus far, and provide a solid foundation for the relationship going forward, observers assert. Indeed, during the presidential election campaign, and since taking office, Trump and his associates have made a series of apparently contradictory statements about China and the goals of U.S. policy. These have ranged, on the negative side, from threats and promises to mete out economic punishments on Beijing and compel it to force North Korea to give up its nukes, to positive affirmations of cooperative ties and a repetition of Chinese formulations of the desired features of the relationship in the future, as Secretary of State Rex Tillerson provided on his recent positive trip to China. While it is certainly possible that such inconsistencies arose from a mere lack of policy discipline and focus, something more deliberately crafty might be happening. It is possible that many of the apparent contradictions in Trump’s China policy can in fact be understood as part of a high-stakes bargaining game that the self-styled Negotiator-in-Chief is playing with Beijing. This game might be aimed at extracting commitments and concessions from Xi at the Mar-a-Lago summit in two pressing areas: bilateral economic relations and North Korea. In the former area, Trump has pledged many times that he will place U.S.-China trade ties on a more just and level footing of greater benefit to U.S. workers and businesses. In particular, he has said that he will supposedly stop Beijing from cheating on trade and violating intellectual property rights and end discriminating actions against U.S companies in China, while bringing many enterprises home to employ U.S. workers. In the latter area, Trump has promised to compel or entice Beijing to exert its supposedly decisive leverage over North Korea to end Pyongyang’s nuclear weapon’s program. And he has pledged that this will occur before the North is able to deploy a nuclear-armed ICBM capable of striking U.S. territory. The apparent negotiating game that Trump is attempting to put in place to achieve these goals in some fashion probably consists of two basic elements: the “set-up” or “give” and the “payoff” or “ask,” combined with an implied threat. The “set-up” consists largely of two types of actions: the creation of a positive atmosphere through flattery and cooperative gestures, and the granting of concessions. These are both designed to create a sense of optimism and gratitude or indebtedness in the mind of the opponent. In this stage, disturbing Tweets, off-the-cuff remarks, and past criticisms are dismissed as mere momentary lapses, and not to be taken literally. From this perspective, one can speculate that Trump and his associates are well into the “give” stage of negotiation with Beijing. At least seven gestures and actions taken to this date can be understood as part of this tactic. First, Trump’s precisely worded granting of Beijing’s supposed “request” to endorse the One China policy, which he had previously hesitated to do. Second, the decision not to label China a currency manipulator or levy 45 percent tariffs on Chinese imports, as had been promised during the campaign. Third, Tillerson’s above-mentioned precise and deliberate repetition while in Beijing of the Chinese prescription for the bilateral relationship (“built on non-confrontation, no conflict, mutual respect, and the search for win-win solutions.”), which the United States has previously avoided repeating. Fourth, earlier reassuring comments of a lack of any intention to destroy the North Korean regime, combined with Tillerson’s expressed desire to persuade Pyongyang to open its society and develop economically in return for abandoning its nuclear weapons. Fifth, a notable absence of any criticisms of China’s human rights abuses. Sixth, the suspension in recent weeks of previously tough U.S. language and assertive actions with regard to Chinese activities in the South or East China Seas. And finally, the granting of the Mar-a-Lago summit itself, which Beijing strongly desired. First, greatly heightened Chinese enforcement of existing sanctions against Pyongyang and strong support for the application of additional so-called “secondary sanctions,” combined with more tough language directed at bringing North Korea to the negotiating table. Beijing’s willingness to comply with this “ask” has been described by some in the U.S. government as the primary indicator of the prospects for cooperation across the entire relationship. Second, an agreement to eliminate or reduce onerous Chinese restrictions applied to high tech and other businesses active in China, including the services sector. Third, an end to Chinese de facto tariffs affecting U.S. automobile exports to China as well as subsidies of Chinese exports of steel and other basic capital goods to the United States. Fourth, a pledge to achieve certain verifiable targets in reducing Chinese violations of the intellectual property rights (IPR) of U.S. and foreign companies. Fifth, a significant commitment to job-producing investments in the United States in a variety of sectors permitted under U.S. law. Along with these “asks,” Trump could also imply that he is prepared to take certain very negative actions if Xi does not comply. 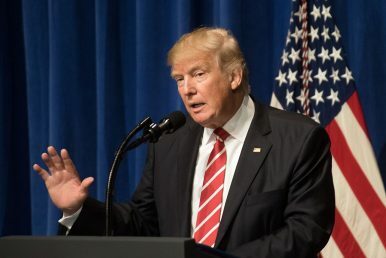 These could include reversing his stance on the One China policy, actually pulling the trigger on tariffs, providing a larger arms sale package to Taiwan than originally planned, accelerating plans to deploy the THAAD missile defense system in both South Korea and Japan (something Beijing strongly opposes), and preparations for possible preemptive military actions against North Korea’s nuclear facilities. Such threats would in some cases violate existing U.S. policies and might not actually be implemented due to domestic reaction, but could nonetheless place pressure on Xi during the summit and immediately thereafter. How might Xi respond to the above strategy, if it exists? Well, one hopes that Trump has already conveyed to the Chinese the major elements of the “ask” outlined above, so that they can prepare their response. Unfortunately, one cannot guarantee that he will provide such advance notice, since the president places a high priority on keeping his cards close to his chest. That could spell disaster for the summit, however. Chinese leaders hate nothing more than surprises in diplomacy, especially if they involve pressures and ultimatums of an unacceptable sort. At the same time, Xi might agree to at least some of the desired “asks” in the economic arena, especially regarding IPR and Chinese investment in the United States. Indeed, he might come to Mar-a-Lago with offers in these areas, thus diminishing tensions, while presenting his own “asks.” These could include the suspension or termination of THAAD in South Korea, a modest U.S. arms sale package for Taiwan, and a clear, unconditional reaffirmation of both the One China policy and respect for China’s core interests. And who is to say that the Great Deal-Maker will not agree, if Beijing agrees to most of the above U.S. “asks”? If he does, the results could be very messy, since such deals would in some cases require policy reversals and overcoming domestic opposition. Only time will tell if the above Trumpian strategy is indeed unfolding in the run-up to the Mar-a-Lago summit. But if it is, the resort’s bucolic surroundings might witness something far more substantive than mere toasts and soothing words. Michael D. Swaine is a senior fellow at the Carnegie Endowment for International Peace and one of the most prominent American analysts in Chinese security studies. This article originally appeared in Chinese at dunjiaodu.com. Arms to Taiwan and Action Against a Chinese Bank: Is Trump's US-China 'Honeymoon' Over? Is the Trump administration taking a warning shot across Xi Jinping's bow or is this a broader shift in approach? The Iran sanction waiver issue is just the latest manifestation of New Delhi’s rising challenge in managing ties with Tehran.